Is $49.97 sound about right for a 5 shelf 36"Wx24"Dx72"H? I also found one that was $34.97 and it was 5 shelf 36"Wx18"D.
I'm thinking about building my rack this way. I like the idea of flipping the shelves upside down and glue the boards on the bottom of each shelf. My current rack use heat cable and each shelf is routed for the cable to flush evenly. My question is this, should I flush the heat tape on each boards or can I just tape it onto the board? I've never used a heat tape and I'm concerned that the bottom of each tubs could damage the heat tape? Just finished building my first rack, a modified version of these plans (I found some 36"x18" shelves on sale quite cheap, along with some perfect hatchling/juvenile tubs from the dollar store). I've at least glanced at all of the entries on here & haven't seen this idea mentioned: if you don't have an electrical saw, or you DO have one but don't trust it to get the leg pieces even/uniform (this was the case with me), the tool for the job is an old-fashioned mitre box! As the author of this post mentioned, a hack saw will wear you out, but with a mitre box, it's nearly effortless cutting through a plastic leg, and the result is pretty well perfect every time. I've used the same Flexwatt heat tape on the bottoms of each shelf for over 3 years without problems, for both adult and baby tubs. Just make sure that your tubs don't rub the wire connections and you'll be fine! I just built these! Make these changes! I just built these and have the following recommendations. First the originals shelves mentioned in this post from Lowes are long gone. 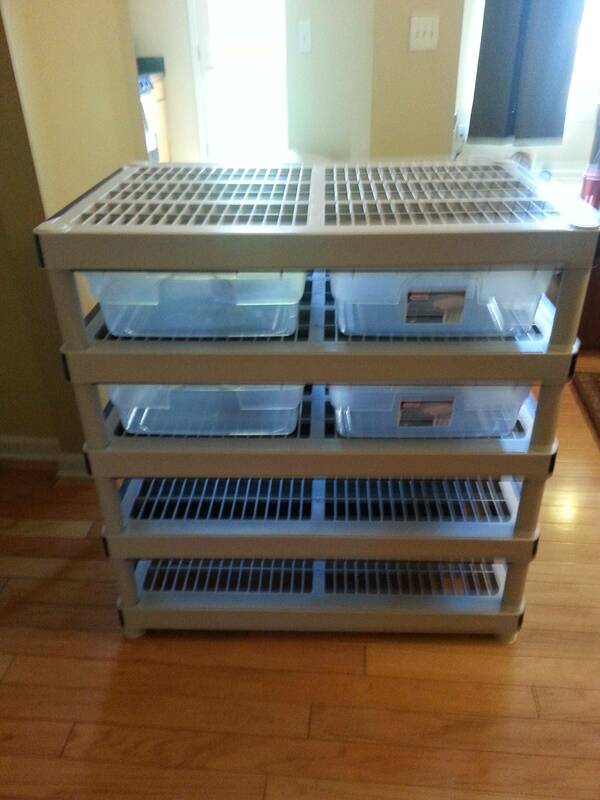 Buy the HDX brand 5 shelves unit from Home Depot instead! I got some different ones from Lowes and while they are fine shelves for general storage, for our purposes, the one's from HD are much better suited, because when you go to glue the bottoms on the shelves, there's nothing to glue to but 2 tiny ribs on the Lowes units, while the HD's have nice flat faces to glue to. It has taken me several times of gluing to make the Lowes work, and it's still shaky at best. If they come loose I will probably can the whole deal and switch to the HDX brand. An fairly expensive mistake. This is something you can't know until you build them, so take my advice. The other thing is don't use the" pegboard material" , use the white sided laminated stuff, as it will be waterproof/resistant, and it's the same price. You will have to modify your measurements from the plans for the cuts slightly. Just measure the racks distance between the posts and then front to back and you will be golden. I will note that Lowes did cut my laminate board for free, and according to the post, HD charges for that? Also buy your tubs after measuring whatever racks you get, don't assume you will find the perfect size to make the width fit. OK ! I have basically built these 3 times now!!! The glue is definitely an issue to get to stick to the plastic. I will say this up front. I have bought some pre-built racks from various makers and I say IF YOU CAN AFFORD IT, go that route! They are nicer, more compact, look better, enclosed, better heat retention, etc. What I ended up using was contact cement. Lather it on, wait 15 minutes to tack up, and then you are done! No waiting overnight, only to find that the glue did not work! I did not use GOOP, which may have been a mistake, but it seemed I would need several tubes and I didn't want to drop $20 just on glue. Has anyone expanded these after the initial build? I'm going to be doing a 24" deep four shelf for 28qt Sterilite tubs right now, but was wondering if I should just go ahead and double up on it (which would be stretching the budget) or if I could just take off the top shelf and add another on top fairly easily in the future. Used the 24" deep shelving unit from Home Depot. Everything else is pretty much the same except for the ecuboard, which I painted with a couple of coats of weatherproof paint to seal it from moisture. I was going to use the markerboard that was suggested, but Home Depot only had the 2x4 sheets for $11 a piece instead of the $24 for 4 deal that was posted on their web site. Oddly, it fits two 32qt Sterilite tubs per shelf with no modification to the legs even though, based on the measurements, it shouldn't. I guess it's because the tub measurements are including the tops which are not being used. Still waiting on heat tape to show up, then I'll level all the shelves, set the clearance, add the heat tape, screw them together, and start filling it up.